Just what is a "Hospital Cage" and why do you need one? This is a topic I've been asked to cover by several people, so here it goes. A hospital cage is simply a small cage in which you put your sick or injured finch for the purpose of separating it from the flock while it recovers. Some people use flight cages. Others, like myself, use smaller cages such as travel cages or show cages. Personally I like the smaller cage. 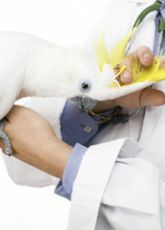 It makes catching the finch to administer medication or treatment a tad easier. Plus you don't spend several minutes trying to catch the finch, which stressed the finch out even further. I figure the less traumatic the whole experience is, the better. I have two small carrier cages that will hold one finch, and I have several show cages which will hold a pair. The show cages work very well if treating a mated pair, separation from one's mate can prove very stressful. You are welcome to use any type of cage you wish for your hospital cage. What's important isn't as much the cage itself as the conditions inside in the cage. The cage must be warm and humid. A heat lamp or heating pad work very well for this. It's best to keep the temperature around 80 degrees Fahrenheit or 26.5 degrees Celsius at all times. Check the temperature several times until you are certain it stays around the desired temperate. Humidity isn't usually a problem. The small dish of water you provide the finch should put enough moisture into the air to keep the finch comfortable. Next the cage needs to be kept away from the rest of the flock. In the case of an infectious disease you really don't want to expose any more finches to it than necessary. 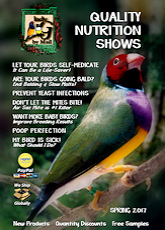 This includes the healthy flock and any other finches that may be in hospitals. Which is why I use the smaller cages. While the finch is healing you'll need to keep it calm and relaxed. Keeping the hospital cage away from people and pets in your home will help. You do want the finch to maintain its normal day/night schedule if it is able. Give it plenty of light during the day, and dark at night. If you cover the cage at night please double check that it doesn't become too hot inside for the finch. Also don't put the cage in direct sunlight. Over heating the finch will not help it one bit. Food and water must always be easily accessible for the finch. If the finch is unable to move well keep the food and water within easy reach. I often put the food and water on the floor of my hospital cages making it as easy as possible for the finch to find nourishment. 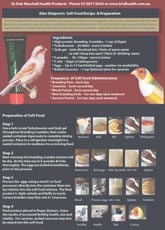 If the finch is more active and doesn't need such special care, normal food and water placement in the cage is fine. Perches and/or nest are optional but border on unnecessary. If the finch can't perch then obviously you won't need perches in the cage. In fact if the perches are low the finch could bump its head into them and get a little sore. If the finch can perch then by all means, give the finch a place to perch. Nests are something I only put in hospital cages on occasion. When I do use a nest it's always a plastic canary nest. The canary nests work best because you can still easily see the finch and grab it from the nest if need be. Now that your hospital cage is built you'll need to know when to use it. In most cases this is pretty obvious. If your finch is sick, injured, or egg bound it's best to move it to a hospital cage. The same holds true if the finch is simply plucked. A sick finch will need to be kept by itself in a hospital cage unless other finches in your flock also have the same illness. They will need to be treated with antibiotics or anti-protozoals, which often go into the water. You never want to medicate a healthy finch. Hence we use hospital cages. Egg bound hens need plenty of rest and warmth along with Calcium Plus to pass the egg. If the egg isn't passed quickly the hen will die. Such a hen must be kept comfortable and left alone. Calcium Plus is given as one drop directly in the mouth. Perches and nests aren't needed for an egg bound hen. She'll just lay the egg on the floor of the cage, which is really the best place for it. Injured finches, often males, usually move around and perch well. They can be given a little more space to move, perches, and even a nest to sleep in. They simply need time away from the flock to heal. If an infection sets in you will need to treat with medication. Plucked finches like injured finches just need a safe place to heal. They don't require any special medications though Feather Fast can be used to help stimulate new feather growth. 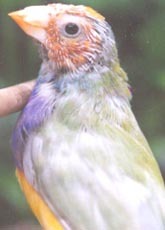 Most finches will re-grow lost feathers in three to four weeks. While plucked finches don't always need the extra comfort of a warm hospital cage, it is best to give it to them. A plucked finch won't be able to regulate its body temperature correctly and could develop other stress-related problems. However you design your hospital cage is fine as long as it's a warm and secure environment for your finch. There is no industry standard for these cages. If you'd like to use the show cage design for your hospital cage you can get the show cage and several of the popular health aids through my site.